It’s hard to convey the refreshment it gave me to open up the Sunparlour Players website and see among the ever- present (ad-nauseam) social media icons on their homepage (you know: facebook, twitter, myspace, youtube, itunes, yada yada) a green symbol amongst the others labeled “BERNARDIN”. The best part? The link really was to the home-canning company (apparently they make there own jam…no joke!). That iconography is, in itself, an adroit snapshot of the larger Sunparlour experience. Labeling themselves as alternative folk or punk folk act, Sunparlour Players exist more in the indescribable outer rim of indie acts who escape description: Macleans magazine described them as “AC/DC visits Little House on the Prairie”, but I’d say they’re more like “Julie Doiron visits Snailhouse” – definitely more experimental and fun than AC/DC, and a lot less formulaic than Little House on the Prairie! Check out the SP music on Bandcamp. The EP “Sunparlour Preserves” is completely worth the 11 and-a-half minutes it takes to listen through. It’s well worth clicking on ‘buy now’ and naming a price that will leave some cash in the band’s collective pockets. And, of course, you’ll see by the name of the album (and the last track) why they have a “BERNARDIN” icon on their home page. The photos of Yanni on their facebook page take the experience even further. SP take their name from the Ontario region nicknamed “Canada’s Sun Parlour”, an area where SP songwriter and founding member Andrew Penner grew up. Besides songwriting, Penner contributes his skills in the areas of lead vocals, guitar, bass, banjo, bass organ pedals (Geddy Lee influence noted), percussion, and kick drum. Michael Rosenthal, the other founding member, is not to be outdone: he brings drums, glockenspiel, banjo, backing vocals, keyboards and bass to the mix. Both Rosie and Penner come from Ontario, and Sunparlour Players make their home in Toronto. While the band delight in arranging their own gigs in any location from barns and backyards to theatres and clubs, they certainly don’t shake a stick at opportunities to tour or perform with other acts, including gigs with Blue Rodeo, Mumford & Sons, and Plants and Animals. 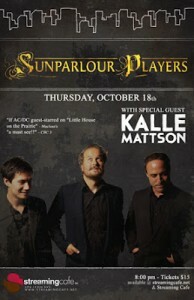 When SP hits Streaming Café on October 18, they’ll be sharing the intimate stage with Kalle Mattson, another Ontario singer/songwriter who is blazing upward in sonic recognition not only in Canada but around the world. Propelling his music and his name globally since this past November, Mattson’s music video “Thick as Thieves” has received on-air and online attention from media giants including Time Magazine, Huffington Post, Yahoo, Much Music, and CBS News. The National Post, in commenting on all this attention, highlighted Mattson as one of five musicians poised to breakout in 2012. The video for Thick as Thieves, created for only $250 in materials (and tons of hours of careful work) showcases the history of the world in stop-motion animation. That’s an ambitious goal in any genre. As a Dylan-inspired solo act who has now grown into a full-on experimental folk-rock quintet show, Kalle Mattson has only been writing songs for three years. But it is pretty clear that he’s found something he’s good at: his 2009 debut album “Whisper Bee” garnered two Northern Ontario Music Award nominations and a Top 100 placement in the Billboard World Song Contest. Album number two, “Anchors”, won the award for Group Album of the year at the afore-mentioned NOMA, and earned Mattson the 2011 SOCAN Songwriter of the Year Award. There was even a song placement on the TV show Degrassi. “Lives In Between” is Kalle Mattson’s newest release, an EP featuring a new lineup and a new sound, and it came out in the spring of 2011. Mattson and crew have been touring the EP extensively while working on a full-length project also due out in 2012. Both of these Ontario acts are impossible to capture in words. Their music needs to be heard to be appreciated. (That sentence is in the passive voice; let’s try that again: You neeeeed to hear their music!!). The Streaming Café website has links to the bands’ websites, where you can hear their music first-hand, and SC is honoured to be able to present both groups live and in-person on October 18th. If you’ve ever been to Streaming Café (596 Leon Ave, Kelowna BC), you’ll know how hard it is to find a seat when there’s good live music in town! Plan to get here in plenty of time to catch Sunparlour Players and Kalle Mattson – and in fact, if you buy your tickets ahead of time you’ll be guaranteed a spot (if it’s not already too late…). 8:00 p.m. on October 18 at Streaming Café. You’ll be glad you showed up!